Take a look inside the Hilton Anatole general manager's schedule. 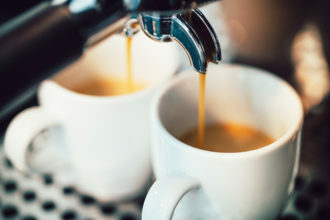 Arrives at the Hilton Anatole and catches up with hotel manager Brett Crafft at Counter Offer restaurant over morning coffee. They outline the day’s meetings. Rapoza and Crafft go on their daily property walk-through. They start in the back of the house and move their way to the front, greeting staff members that work in the kitchen and pastry shop, housekeeping quarters, banquet hall, and communication offices. In addition to exchanging hellos and quick updates, Rapoza receives positive feedback about HHive, which is new for the hotel. Grabs his second cup of coffee at Counter Offer. Rapoza sits in on the daily line-up meeting in the marketing office. Leaders from each department provide updates on the daily schedule for their team, including client events, number of check-ins (on Feb. 6 it was 1,200), check-outs, and expected number of dining guests. Calls Matt Jones, COO/CFO of Visit Dallas, and discusses how to capitalize on corporations that relocate to Dallas-Fort Worth. Lunch with the front office team members at a team dining room called “The Rustic,” which underwent a $250,000 renovation in December. Rapoza eats a small salad, grilled chicken, and green beans, and drinks flavored water offered at the drink bar. Rapoza orders his last cup of caffeine for the day at Counter Offer: a double espresso. This is his “cut off,” because if he has any later, he “can’t sleep,” he discovered. Business review meeting with PSAV, an in-house audio visual and events partner. They discuss integrating virtual reality devices to give tours of the property to prospective clients in place of photo slideshows or video. Monthly meeting with marketing team to review upcoming initiatives and deadlines. One topic of discussion includes decorating and promoting holiday events at the Hilton Anatole such as Valentine’s Day, Easter, and summer 2017, when the JadeWaters resort re-opens. Rapoza joins Ta’alolo Puni Pau, director of recreation, to walk through JadeWaters, the first resort pool in Dallas which spans over 10,000 square feet and includes water slides, a lazy river, swim-up bar, and a cove pool. They discuss design progress, fixing minor cracks in the pools, and preparing JadeWaters’ “first full-season opening … 107 days” from Feb. 7. 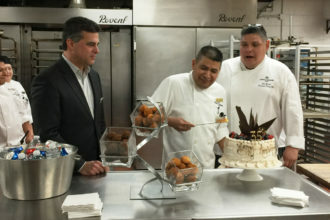 Rapoza pops into the pastry shop to celebrate the anniversary of Edilfoncio Verona, “who has worked at the Hilton Anatole for 35 years, starting at 15 years old.” Rapoza and employees enjoy chocolate cake and lime, coconut, and chocolate macaroons. Rapoza and Saddiq Mir, director of food and beverages, head up to the 27th floor to SĒR Steak + Spirits for the spring 2017 seasonal menu tasting. Executive chef Mike Shetsky presents his take on Rockefeller oysters, deviled eggs, and, of course, a 32-ounce steak, while lead mixologist Colin Silva presents color-changing drinks and liqueur pairings. Rapoza departs for a manager’s event—the Dallas Mavericks’ game against Portland Trail Blazers at the American Airlines Center. Heads back to his home to spend time with his wife Michelle, daughter Kayla, and son Micah. His other son, Dayne, is finishing his last year of college in San Diego.